GPS location or the postcode you type in. There are many services where you can go to if you have an urgent care problem. 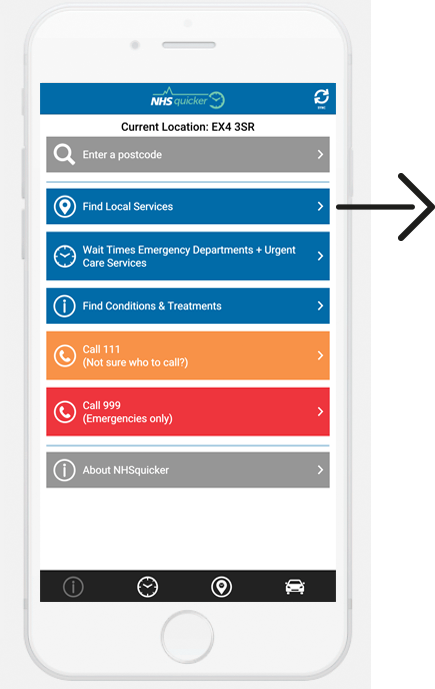 If you use the 'Find Local Services' option, NHSquicker will list the most frequently used services. This includes minor injury units, dentists, sexual health clinics and pharmacies. 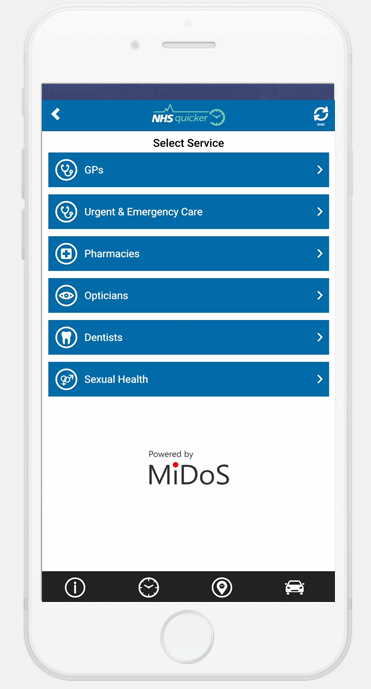 The data comes from the Directory of Services (DOS), which is maintained by the NHS. The information is available based on your GPS location or the postcode that you have entered. You can check the live wait times and decide when to visit an urgent care facility. The urgent care facilities are displayed in both the list view and the map view. The list view provides further details like opening times, facilities available and links to Google Map. The list will always provide the nearest five locations, ordered based on wait time and travel time. Thus, the centres appearing first are not necessarily the ones closest to you. The travel time is based on the mode of transport selected - this can be driving, public transport or walking. 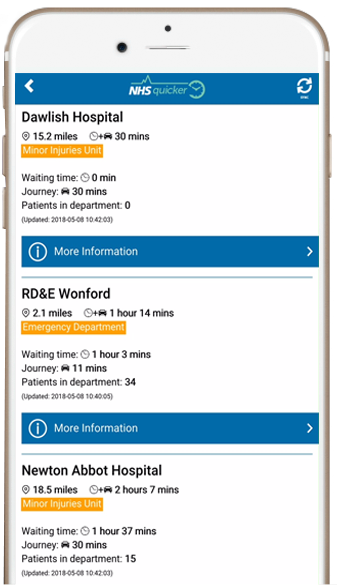 Only urgent care centres that are open at the time the app is invoked will be shown. At least one Emergency Department (ED) will always appear in the list irrespective of geographical distance. These are live wait times so the wait time and the number of people waiting may have changed by the time you arrive. Deciding whether to go can be difficult. The 'Find Conditions & Treatments' option aims to help you decide. 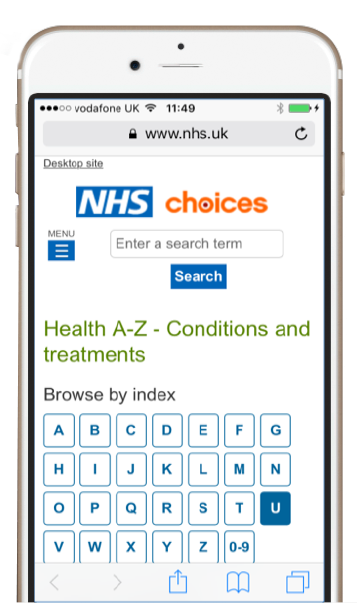 The information is provided through NHS Choices. You can also ring 111 if you need advice with an urgent care problem and they will direct you to the most appropriate services. You can ring 999 in an emergency. 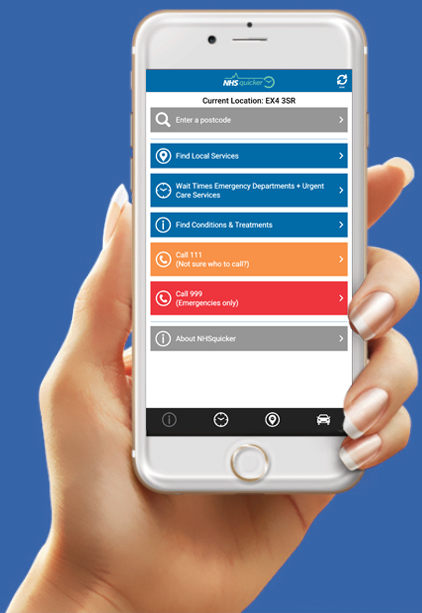 The app is free to download for your phone or tablet or alternatively you can access the web version at no cost from your PC. Can NHSquicker cover other counties? 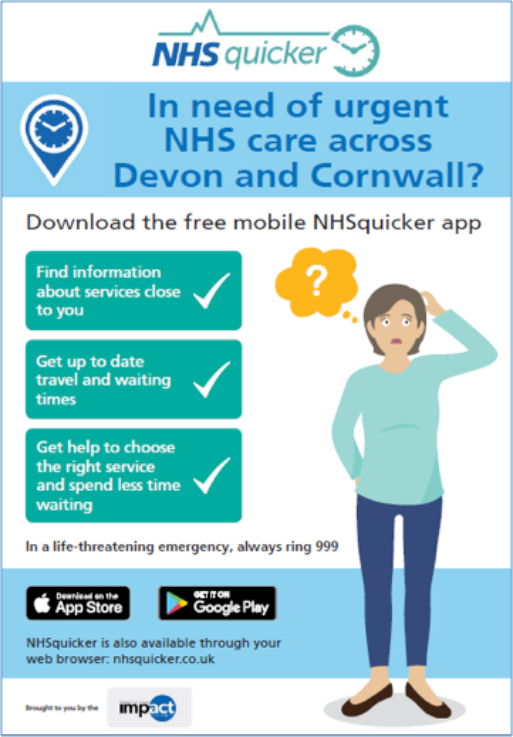 The NHSquicker app covers Devon and Cornwall. 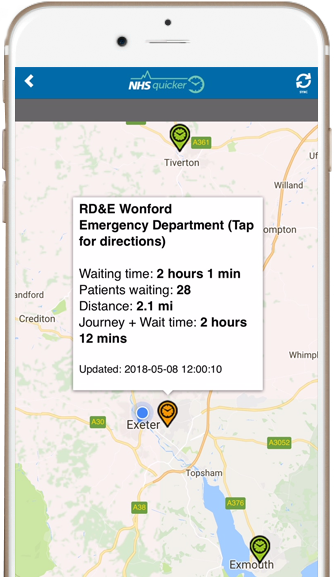 However, the platform supporting the app was designed to be scalable across NHS Trusts in England; it has already been integrated with several ED management systems. If you are an NHS organisation or an STP and are considering the use of real-time ED data and NHSquicker, please contact us by completing the form below. Alternatively, contact University of Exeter Business School or the Horizon Centre, Torbay and South Devon NHS Foundation Trust. NHSquicker was designed by the Health & Care IMPACT Network, a collaboration between health and care organisations and universities, primarily in the South West of England. The purpose of the network is to improve delivery of health and care through applied research, knowledge dissemination and decision support. The IMPACT Network was founded through a collaboration between Torbay and South Devon NHS Foundation Trust and the University of Exeter Business School. If you are interested in becoming part of NHSquicker do contact us. Also do feedback and let us know what you like about the app and what we can do to improve it further. © 2018 Health and Care IMPACT Network, All rights reserved.